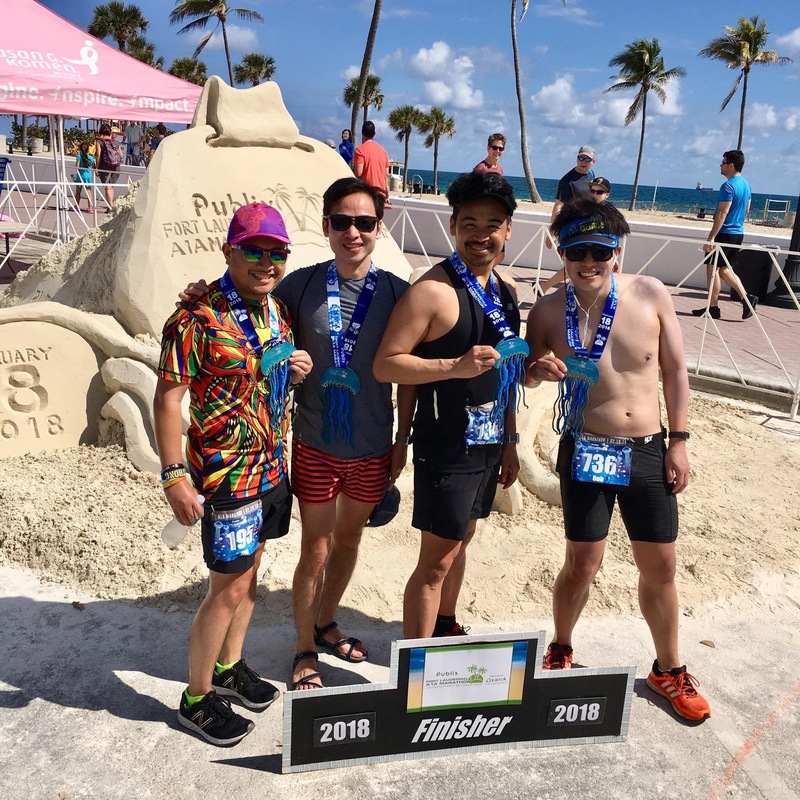 I've run in Florida several times - six times in fact - and the Fort Lauderdale A1A Marathon would be my third full in the state, after having run Miami and West Palm Beach in 2017. 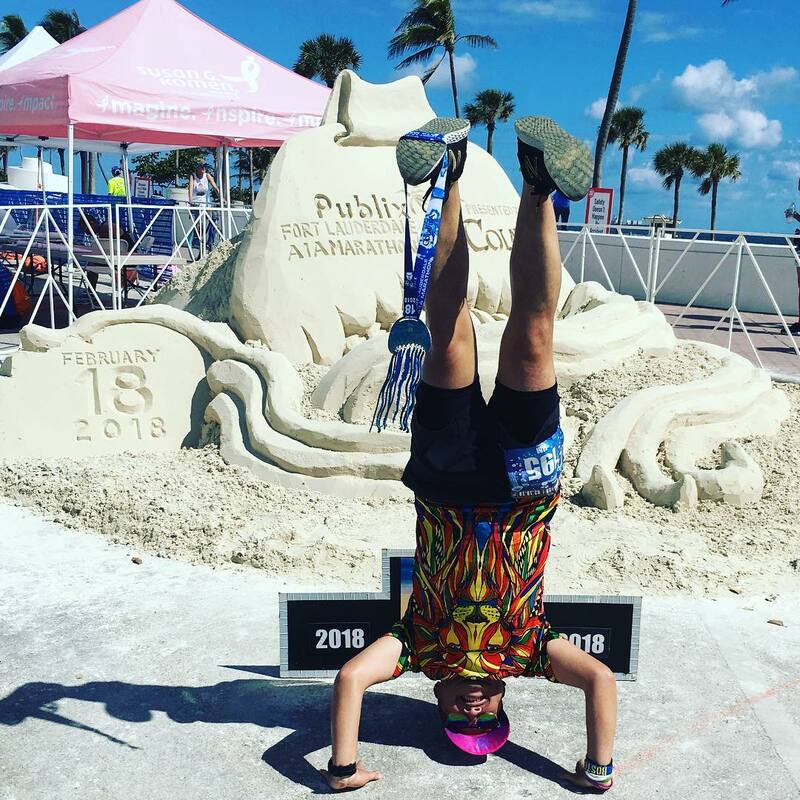 The A1A has been known to provide some of the most inventive and attractive medals around. During the expo for West Palm, I decided to pull the plug and include A1A onto my 2018 calendar. When the weekend came, I was ticketed for a 7:45pm flight on Saturday night, so on the Friday night before, after my birthday dinner with friends, I called Delta to see if I could same-day-confirm onto an earlier flight. Knowing full well that it could be impossible, as this was the beginning of a long weekend as well as a mid-winter break for many people in the NYC area, I asked to be put on the standby list for the first flight in the morning at 7am. Early Saturday morning, I headed to the airport at around 5:15am, and got through security fairly quickly before heading to the Sky Club to grab breakfast. I didn't need to be at the gate until boarding, anyway - and the standby list had me right at the top. Eventually, as boarding began and progressed, it looked like the plane was boarding full, and indeed it did - I've had luck in the past with seats opening up for people missing their flight, but it wasn't to be for that 7am flight. I headed back to the SkyClub and got one of the employees there, a guy named Kris, to list me on the next flight out. Turns out, the 9am had two open seats in the main cabin, and he was nice enough to bypass the "same fare class" requirement needed for same-day-confirming onto another flight, so I had a confirmed seat on the 9am! I got listed on the upgrade list as well, and was able to jump into a Comfort+ window seat before boarding. So I was going to get to Florida about eleven hours early after all! I arrived in Fort Lauderdale to 70 degree weather, much nicer than what I had left behind in frigidly cold New York. I met my friend Seth outside, and while he had already gotten my bib and my friend Carrie's bib earlier that morning, we headed back to the expo anyway, so I could check out some of the vendors. It was a surprisingly smaller expo than I had anticipated, but otherwise, I was able to get what I needed out of it - a box of GU and some free coffee! Seth and I then headed back to his place in the Wilton Manors neighborhood of Fort Lauderdale, with a stop at the mall and for lunch in between, while we waited for his friend Karen to arrive. Dinner that evening was timed so that Seth, Karen, and I headed out to Bona, a local Italian restaurant in Wilton Manors, with me joining them for about an hour before transferring to another table at the same restaurant where I was meeting with three other friends from Front Runners New York who had come down to Florida for the race. Dinner was delicious - we followed it up with a short walk down Wilton Drive to check out the local bar scene, but it was still pretty early... though we took note of it all for Sunday night revelry. I headed back to Seth's to get ready to pass out for the night, as we had a VERY early AM wake up with the race starting at 6am. Between Seth, Karen, and I, we agreed to leave at 4:30, and drive to the start in Karen's car, as she was planning to leave to head back up north to Jupiter right after she finished the half. I only needed twenty minutes to get ready, so I was the last to wakeup at 4am. We drove to a parking structure near the start and with a good hour still before the race, we went about our own ways to do our pre-race rituals. I met up with a few friends including Amy, Lisa, and Danielle in front of the Museum of Discovery and Science, and also met up with Carrie, as I had her bib and bag for the race -- she had quite the morning, as she frantically tried to book a Lyft/Uber from Miami right when the bars there began to let out around 5am, eventually flagging down a cab to take her up to Fort Lauderdale. At 5:35, the national anthem was performed by what's become a tradition for the A1A race - performed by a saxophonist! After the anthem, I self-seeded into the corrals, nestled between the 2:00 and 2:10 half marathon pacers, eventually meeting up with Seth, and running into another fellow FRNY member Michael, who was running the half. The chaos of the start didn't allow for the rest of the FRNY folks to meet us in the corrals. 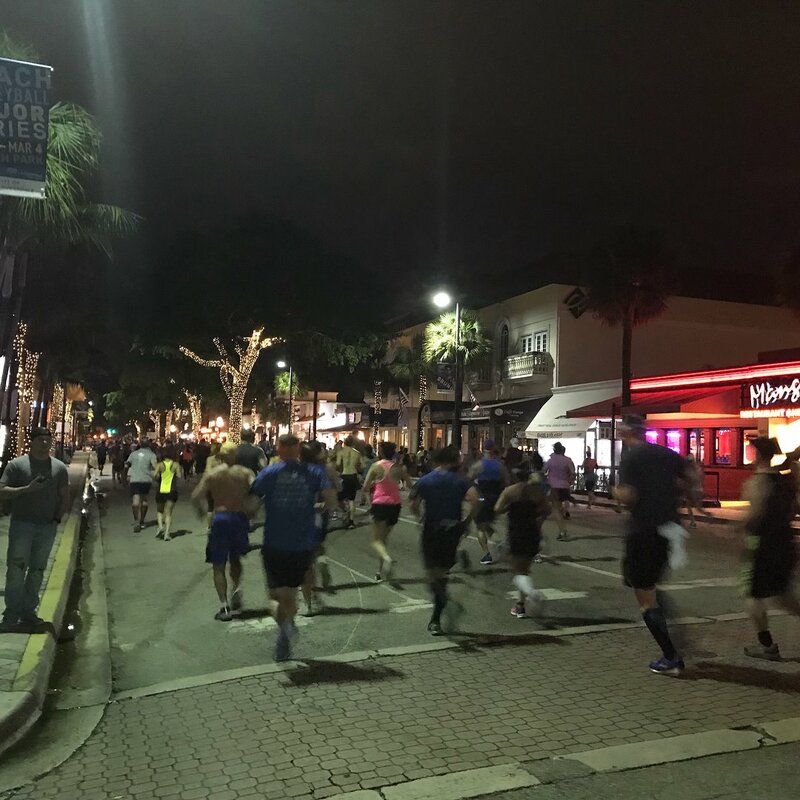 At 6am, we were off, running down the dark streets of Fort Lauderdale, lit only by the streetlamps and traffic lights on the downtown streets. It was definitely warm - my watch registered the temperature as 72, with 88% humidity. I start off conservatively as we made our way eastward along SW 2nd Street, curving along Andrews Avenue to take us to Las Olas Boulevard. A couple miles in, and the thickness of the humidity in the air is palpable. I start to take my walk breaks on the 9/1, vowing to keep this up as much as possible. Continuing on eastward along Las Olas, reaching the "highest" point of the race, a bridge crossing over the intracoastal waterway right to State Route A1A, alongside Las Olas Beach with sweeping views of the Atlantic Ocean. At around 2.75 miles, we turn left to make our way along the race's namesake State Route A1A highway. We pass by Fort Lauderdale's famous Elbo Room bar, just as the sun begins to peek over the horizon. Thankfully, the morning is overcast, so we are spared much of the sun blazing over us in these early hours. It would actually stay overcast for much of the morning, which was a godsend to the marathoners who would be out there for much longer. We ran northward along the A1A for a bit, before turning left at the 4 mile mark onto Sunrise Boulevard. This portion of the race had us complete a loop around the asphalt path that encircles Hugh Taylor Birch State Park, located between the Intracoastal Waterway and SR A1A. Along the way, I end up running into my friend Ben, who had flown down from North Carolina, having finished the Oak Island Half Marathon the morning before. He was just doing the half, feeling a little sore, but content with finishing his first sub-2 half in a few months since sustaining an injury. He continued on as I stopped for a walk break as we continued through the park. 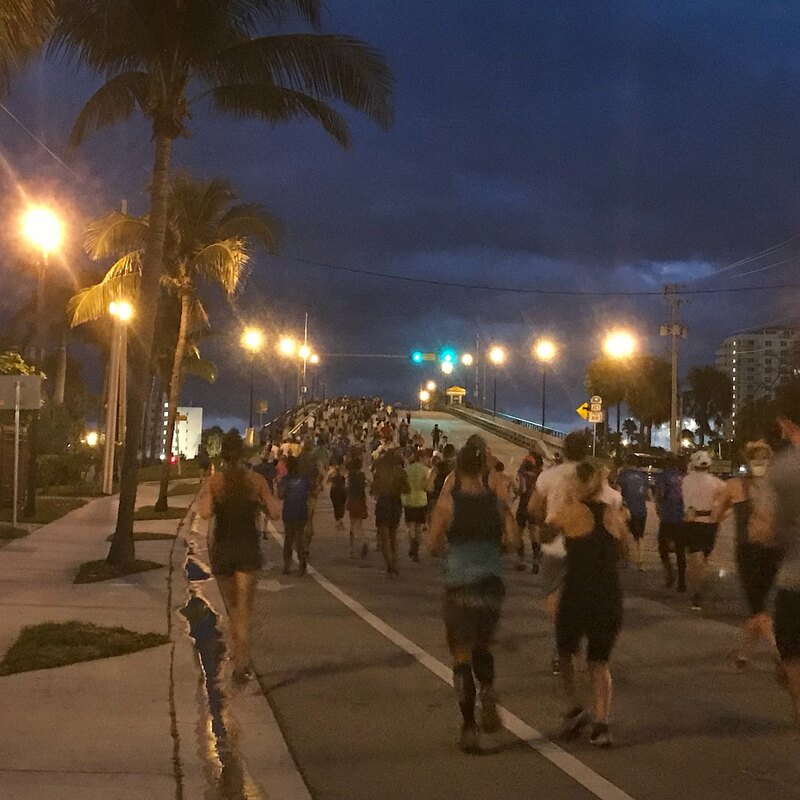 As we closed in on the 6 mile mark, I began to notice a skunky smell, mixed with the unmistakable stench of sewage, likely brought in from the tides from the ocean. With Carrie not far in front of me, I knew she was going to be stopping around here to gather herself - she's quite sensitive to smells. And lo and behold, as I approached the exit of the park, there she was. We decided to stick with each other for the remainder of the race, or as much of the race as we could together. 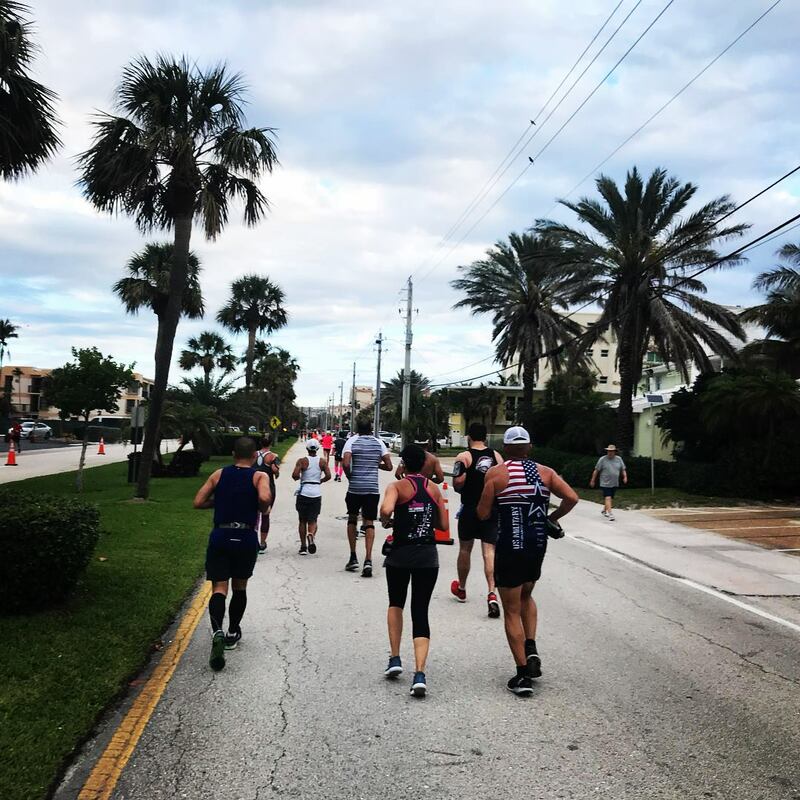 The marathoners continue on north! Eventually, we were back out on Sunrise Boulevard, making our way back to the A1A. 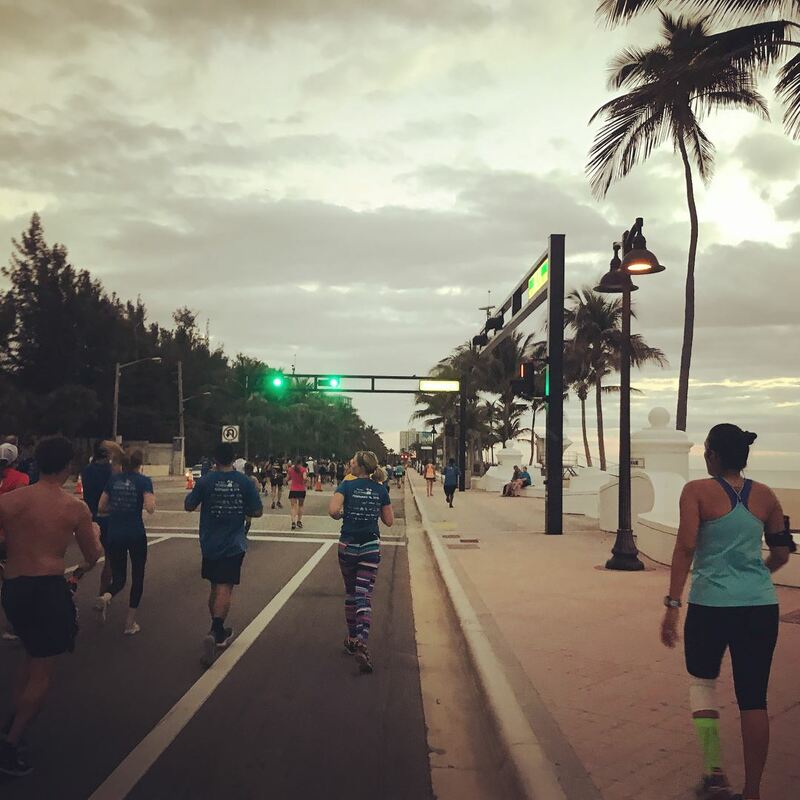 We turned left onto the highway, and continued to run northward, making our way into the communities of Fort Lauderdale Beach and Lauderdale-by-the-Sea. 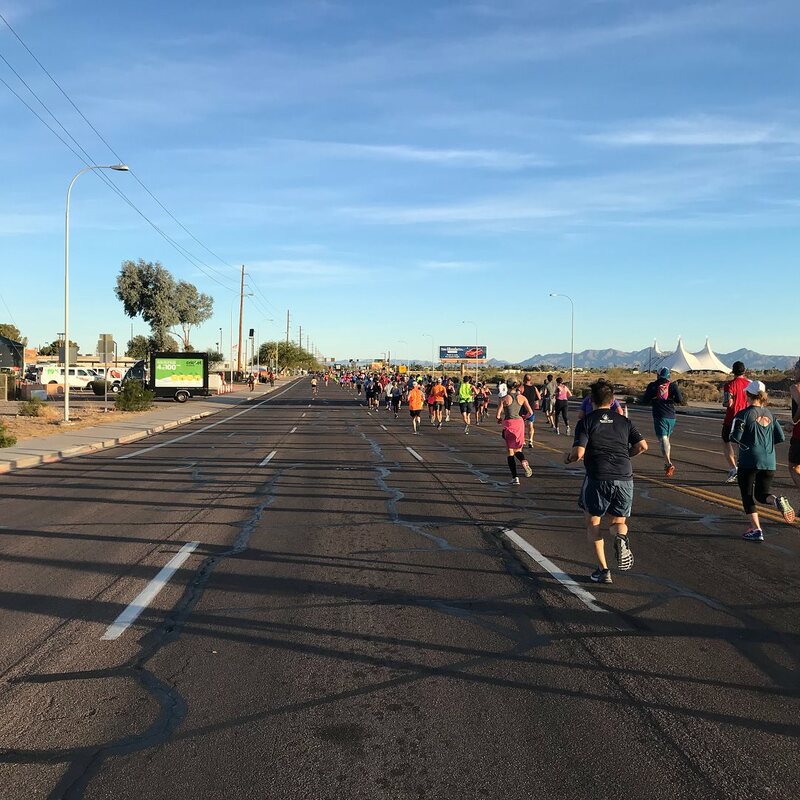 At one point, the faster half marathoners heading in our direction after making their turn around had been led right into the path of everyone else. Someone was not directing these folks into the correct lane, causing quite a traffic jam through the area. Fellow FRNY members running the marathon Tony and Bob passed me by as we made our way up the road. 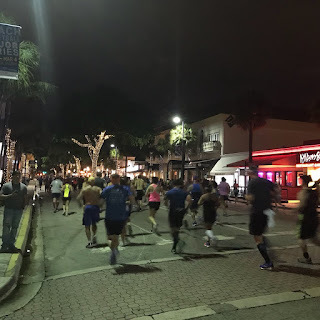 It was just after Lauderdale Beach in the Galt Mile area, however, that the half marathoners did their turn around, and the rest of us marathoners emerged onto wide open roads along A1A, continuing on northward for quite sometime, much less crowded. 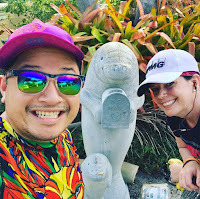 We veered right onto El Mar Boulevard, and into Lauderdale-by-the-Sea's beachfront strip, passing by Anglin's Fishing Pier (the longest pier in South Florida), before returning to A1A. 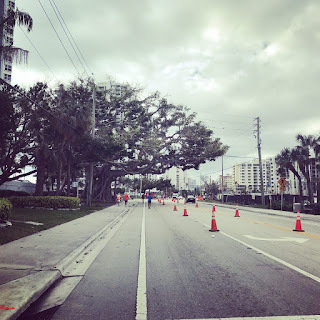 As we continued northward through Sea Ranch and into Pompano Beach, the scenery became very monotonous, as pretty much everything on either side of us was a condominium building, many of them slathered in pastel colors, synonymous with south Florida. The morning heat began to take its toll, and Carrie and I slowed down enough to cross the halfway point, where my friend Heather had parked herself with the Marathon Maniacs sign, ice pops, and beer, at about the 2 1/2 hour mark of the race. By then, we knew going under 5 hours was likely not going to happen. Heather providing us ice pops. THANK GOD FOR HEATHER. We continued on northward, past more condos, and deep into the residential area of Hillsboro Shores, one of the few single family home communities on the barrier island of the city of Pompano Beach. Carrie and I stopped to take a selfie with a mailbox in the shape of Florida's state marine mammal, the manatee. The course circled around to its northernmost point, taking a right along Bay Drive, where an aid station was located, and then diverted along Beacon Street back to the A1A before looping back around to Bay Drive for the run back, but the turn onto Beacon Street was very unassuming - in fact, while Carrie and I turned left, we saw another runner in front of us seemingly going in the wrong direction. Oh well -- she may have likely figured it out coming back around, and it wouldn't have been much additional distance to run. As we finished our last northward trek along the A1A, we saw the bascule bridge in the distance over the Hillsboro Inlet lifted upward to let a ship come through. We joked how that was definitely not a hill in this super flat race. Returning back along the A1A... still so much more mileage to go. Jokes. I literally can't do this. 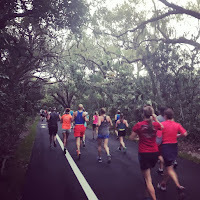 The run back along the A1A was rather uneventful for the both of us - the sun had peeked out past the clouds and was definitely assaulting our sensitivities. The monotony of the course was definitely getting to us, as was the heat emanating off our faces. We basked in any moment the condos could give us some semblance of shade, and then complained to each other when it was beating us down. We definitely got to the point in the race where we were not enjoying the temperature situation (we don't enjoy running in heat and humidity! ), and wanted to complain for the sake of complaining. Along the way, Front Runners Fort Lauderdale friend Paul had caught up, and he ran alongside his sister, who had come to help pace him for a few miles near the finish. At around mile 19, Carrie needed to push forward a bit to keep her legs underneath her as we did our periodic run-walk breaks, but eventually as we made our way past the wall a mile later and in Lauderdale-by-the-Sea, I caught up to her, and we continued on for the last 10k of the race. This last 10k was brutal under the morning sun, and we kept using each of the traffic lights as markers for when we would run and when we would walk. With a little over two miles left to go, we passed Hugh Taylor Birch State Park where Carrie and I had started running together, and we pushed ourselves as best as we could inching ever closer to the finish. We both really just wanted this medal. Eventually, we got to Fort Lauderdale Beach Park with less than half a mile to go, and saw an inflatable Publix arch in the distance, happily rejoicing that the finish line was so close... but no.. it was a FAKE and was only the 26 mile mark. The actual finish line was about 0.2 mile away, so we trudged on and crossed the finish in 5:49:52, just barely ten minutes under the hard 6 hour time limit. 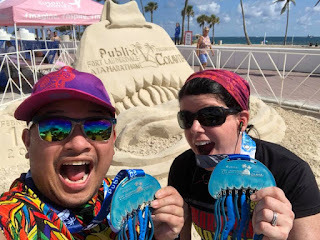 But we didn't care... we were done, and got the pretty jellyfish medal we were both pining for. The temps were crazy - 79º, but a "realfeel" of 83º -- no wonder we were spent. After the finish, we got photos with the massive sand castle built especially for the race - and I also got to do my headstand - before catching the schoolbus to take us back to the startline area. 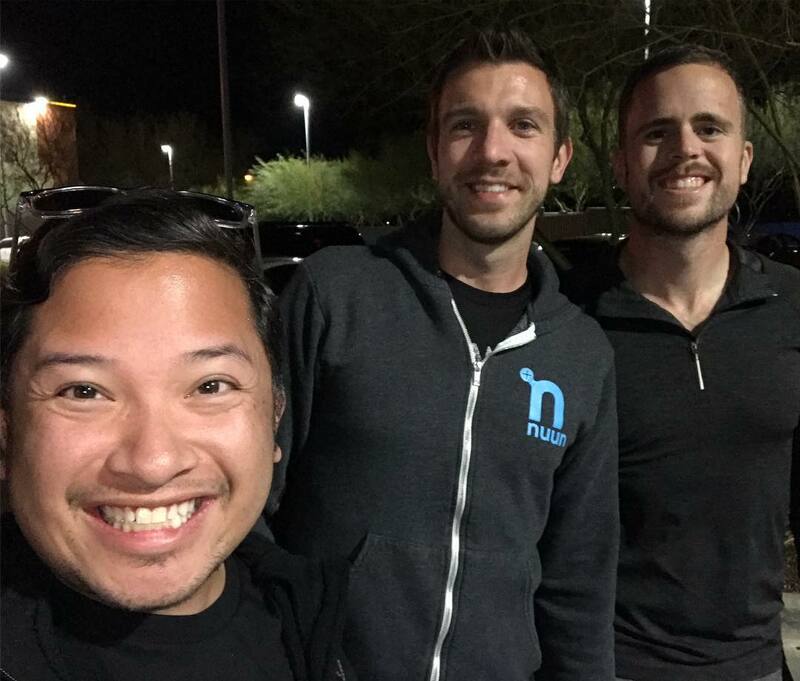 From there, Seth, Paul, and I caught a Lyft to take us back to Wilton Manors. After a bit of rest for the rest of the afternoon, Seth and I grabbed some dinner and just lazed around - I had decided to take a morning flight on Monday because of the holiday. With that, another marathon done... with a pretty medal hard earned. I left work early on Friday, and caught a 3:40 pm flight out of JFK to head down to Atlanta, where I would connect for my flight to Jackson, Mississippi. I arrived in Jackson a little after 8pm, and my friend Hollie picked me up from Jackson's Medgar Wiley Evers International Airport, taking me into downtown Jackson to a blues club to meet up with our friends Sherry and Zach, who we'd be staying with for one night at the Westin. 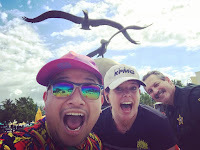 They had already picked up my bib for the race, and I was basically flying in to run the race and flying out the next day in the afternoon. 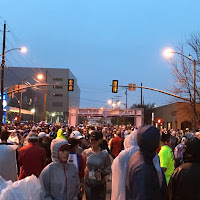 I had run the half marathon here in 2015, an exceptionally cold edition of the race, where the temps were dipping close to 20 degrees race morning. 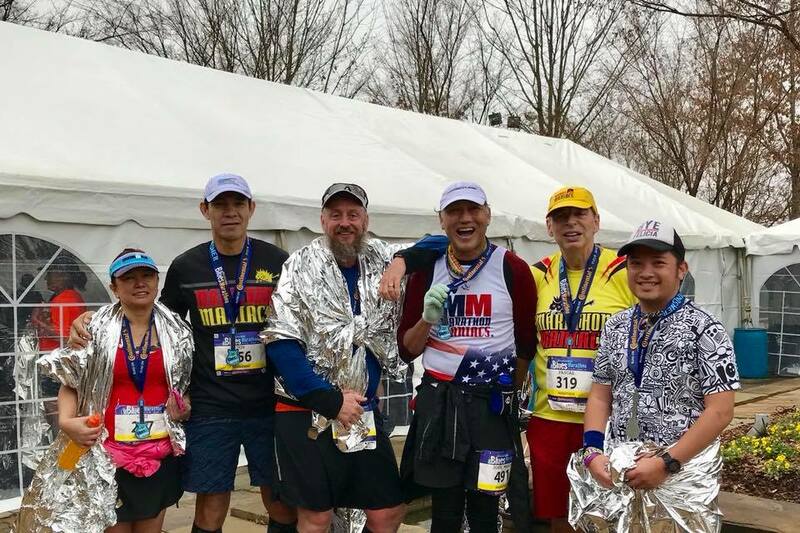 This time last year, I was attempting to head down again, this time to to run the full marathon, but encountered a freak ice storm that would eventually cancel the 2017 edition of the race. 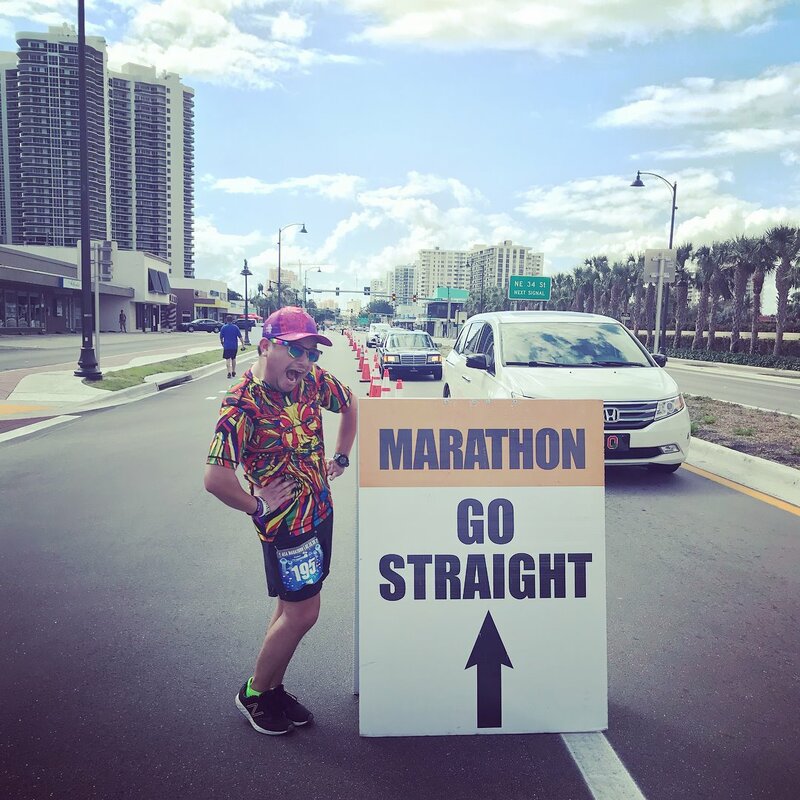 This race was added to my calendar last minute, because I unfortunately learned that the Mississippi Gulf Coast Marathon (which I ran the month prior, December 2017) was measured short by 295 meters due to human error in setting up the race course the morning of the race. 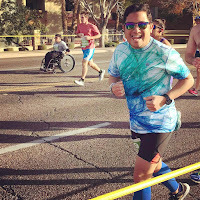 In order for the 50 States Marathon Club to count my completion of this state, I needed to run the full 26.2 mile distance, and this was the first opportunity for me to do so that fit into my calendar. 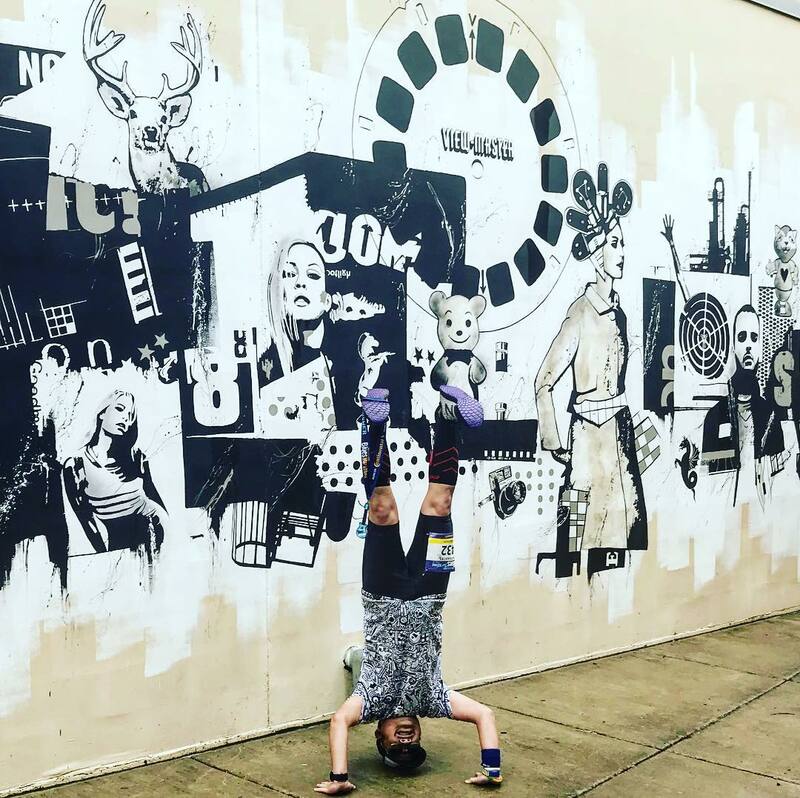 Finally, I could check off Mississippi from my list of states for marathons... on my THIRD attempt. The weather forecast was not going to be freezing like in 2015, or threatened by an ice storm like in 2017, however rain had been set for race morning for the past week, and precipitation was prety much inevitable, though exactly how much it would pour was still yet to be seen. 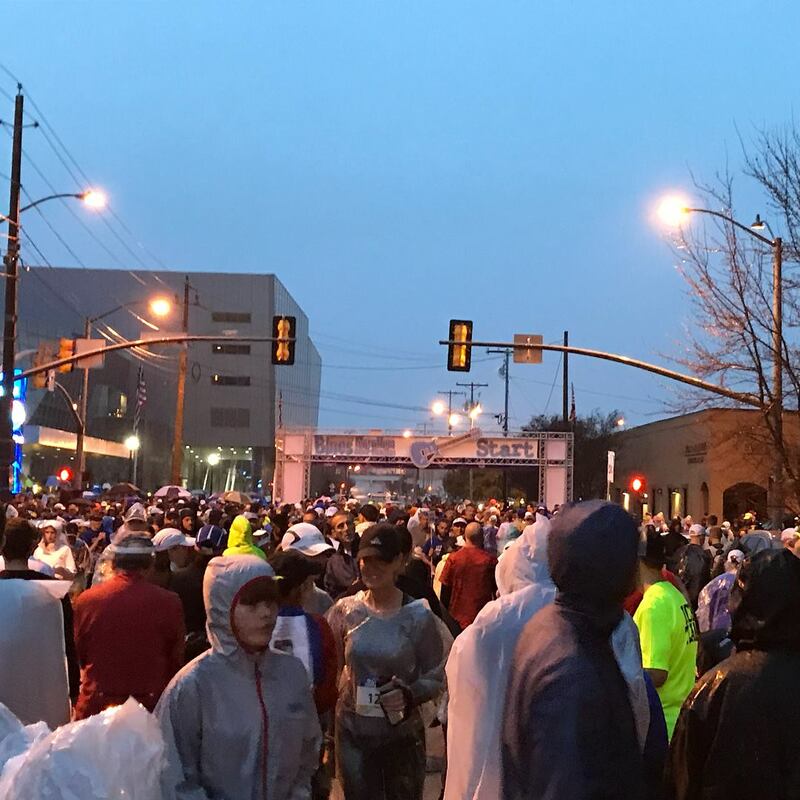 With the race starting at 7am, and our hotel steps away from the startline, we begrudgingly woke up a little after 6am, rolling out of bed, and headed out into the rain, to where runners were all congregating on Pascagoula Street between Lamar and West Street. Decked out in my "Hidden Meanings" INKnBURN tee, with Hollie matching in the women's version of the shirt, we set out in the rain at 7am, temps in the mid-50s, but the precipitation falling steadily. After the national anthem was performed, traditionally at this race by a blues guitarist, we headed west and into the direction of Jackson State University. 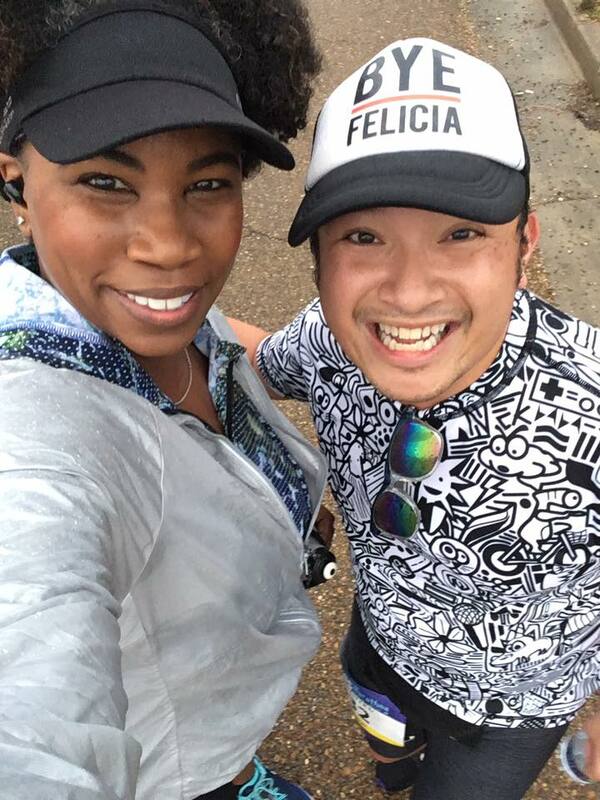 Hollie and I stayed together for the first couple miles, as we eased along the ups and downs of Pascagoula Street, dodging walkers and the periodic pothole we encountered along the way. 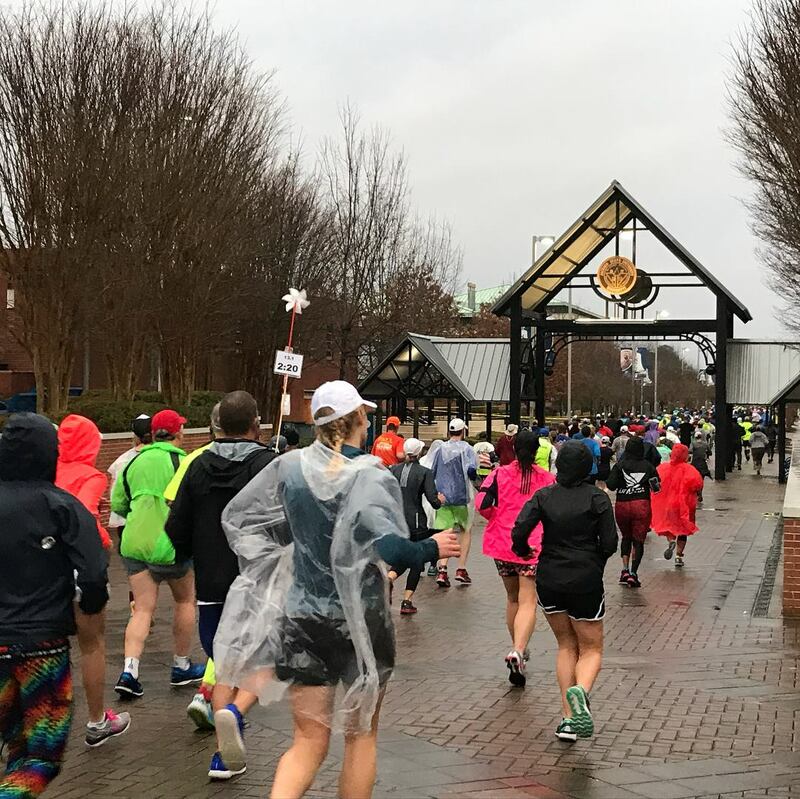 The runners en masse veered left and along University Boulevard and onto John R. Lynch Street, which passed right through the middle of campus, passing underneath the school's welcoming archways. We turned right past a roundabout along Dr. Robert Smith, Sr. Parkway, named after an influential civil rights activist and medical pioneer of the 1960s, who to this day serves as a community leader in both the city and at Jackson State University. 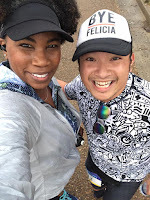 The parkway connects JSU to downtown Jackson, and along the way, not only did I run into my friend Ken, who was pacing 4:50 for the marathon, I ran into Tywana, who called out my name as she had recognized me from a race I did in December of 2016 in Atlanta! 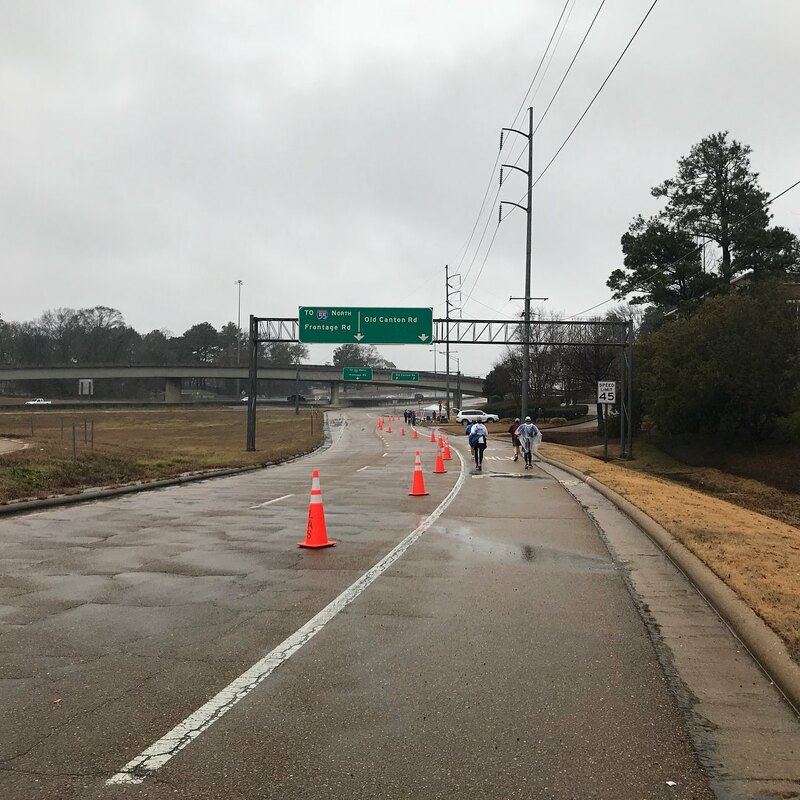 Over the next few miles, we returned to downtown Jackson, passing the startline once again, before turning left and cruising north along State Street. 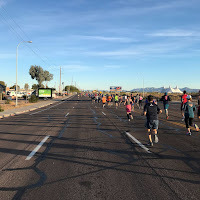 We passed Jackson Brace and Limb Company, an orthotics and prosthetics store along the course, which I had fondly remembered during the 2015 race - an ironic sight to see while running a marathon. The hills kept rolling on and on as we crept further north, passing the mile 6 mark, and still instep with those running the half marathon - we passed Jackson's large medical district, where after passing the Baptist Medical Center in Belhaven to our left, we came upon the University of Mississippi's School of Medicine Campus, before taking a slight right turn onto Old Canton Road. We curved our way around a circular road and passed mile 7 before the half marathoners split off and the marathoners were left to quietly continue on by our lonesome, as we zigzagged our way through the serene residential neighborhood of Fondren, an area considered the arts district of Jackson, though we were confined mainly to the residential roads, treelined by massive oaks that towered over all else. Our first glimpse of the commercial area of this neighborhood came a few miles later, as we came out on State Street and Meadowbrook Road, continuing eastward as the rain began to fall a bit more heavily. An abandoned strip mall served as a relay exchange location as we struggled forward on Jackson's brown asphalt streets. 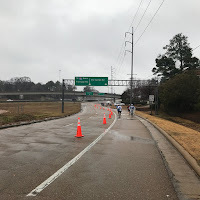 At the 11 mile mark we turned right along a frontage road for the interstate, momentarily commingling with the half marathoners as they came to an underpass section from the other direction before taking off again in different directions as we headed northward on Old Canton Road. 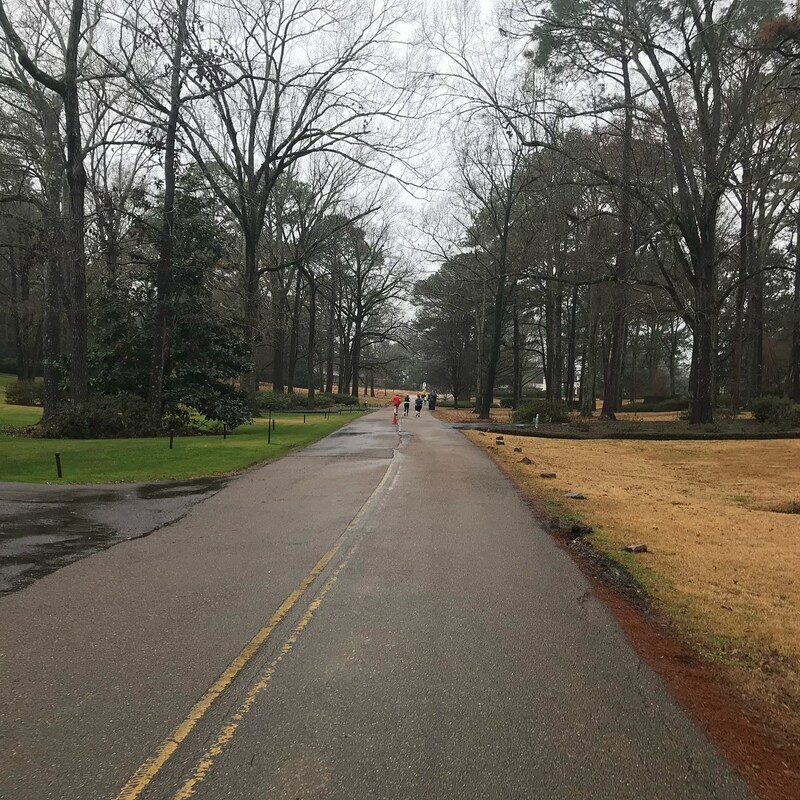 The rain stopped momentarily as we reached the northernmost point of this race at the 14.25 mile mark on Briarwood Road. A couple blocks later, we began our trek southward along Ridgewood Road, making our way down a nice downhill stretch as the rain, once more, began to pick up again. We turned left onto Sheffield Road just before the mile 16 mark as we passed private school Jackson Academy, the largest independent school in Mississippi. The next mile and a half cut through this upper-middle class residential area, an area of modest homes with spacious front yards. Along Meadowbrook Road, we entered the Eastover neighborhood of Jackson, flanked by two stone entrance pillars and manicured garden area. The homes here were very stately, with massive lots and even more spacious front yards than we had seen before. This was even more evident as we made our way down Eastover Drive, passing some beautiful mansions with such apparent southern charm. Course marshals led us around the curving route that had us encircling the neighborhoods' many lakes. At mile 20, we crossed Ridgewood Road, and came out of the residential area, running up a gradual uphill toward the highway. After passing the Mississippi School for the Deaf, we turned left onto the frontage road of I-55. After just under half a mile along the frontage road, we turned left to an unassuming back gate of what seemed like a farm area. The asphalt gave way to a gravel road that was slightly muddy due to the rain. We were running through the grounds of the Mississippi Agriculture and Forestry Museum, which contained a living-history farm and a recreated 1920s cotton-economy-era town. 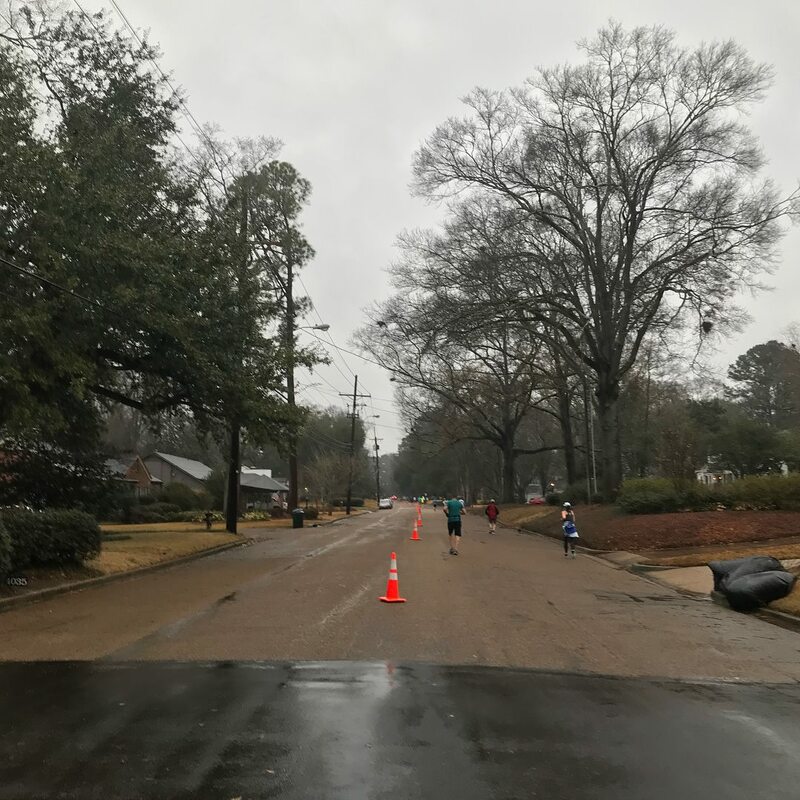 We exited the museum grounds and ran alongside the shoulder of Mississippi Highway 25 before crossing the multi-lane street past a long line of cars waiting to cross the road. 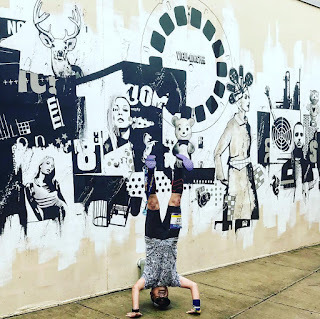 We than ran up Highland Drive, a road that skirted the edge of Lakeland Park, the Mississippi Children's Museum, and the Mississippi Museum of Natural Science. The road was pretty exposed, so we got the brunt of a headwind blowing right at us as we made our way further down the course. It was also a bit hilly, so I was reduced to walking for a good portion of this road, before it turned into a downhill as we ran through the last bit of residential neighborhood in Belhaven. 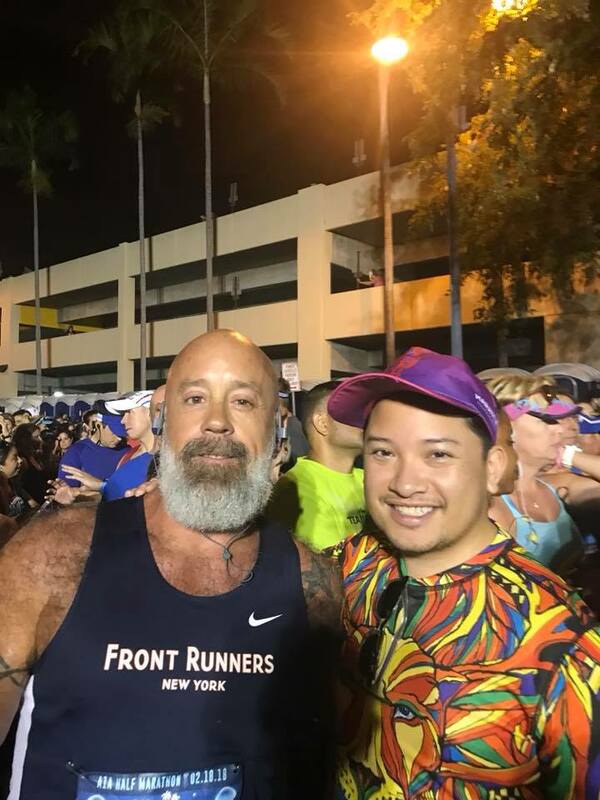 We were less than 3 miles from the finish at this point, and along the way, I ran into my friend Gaby, seeing him for the first time in the entire race. 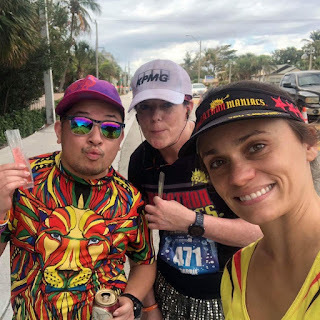 We ran together for a little bit, even stopping for a little imbibement of beer as we passed some spectators cheering on the runners, before I decided to slow down. Eventually, before us we had a lengthy straight shot along North Street, taking us past the first time I saw the Mississippi state flag along the course. The state flag is a bit controversial, as it is the only state flag remaining that still uses the stars and bars of the original confederate flag in its design. All throughout the course, I saw other flags being flown by residents in front of their homes - either the American flag, or a different design which I later realized was a new proposed design for the Mississippi state flag that has recently began to gain traction. Within the last mile, we ran past the Capitol building and the road curved into State Street. 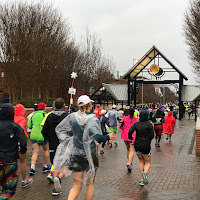 We ran through a cheer tunnel as we made our last right turn onto Court Street and past the Westin and the Museum of Art before curving along the road finally to the finish line, where I crossed in 5:45. I found several other friends after finishing, and grabbed some much needed food in the form of pizza before heading back to the Westin to shower and get my bags together. I ordered an uber and got myself to Jackson's airport quickly, where several other runners (including my friend Ray and his wife Janice) were congregating for the same Delta flight to Atlanta. It was a very quick trip out to Jackson, but rewarding to FINALLY get the state checked off. 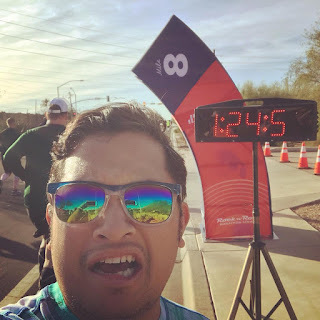 For MLK Weekend 2018, I decided to return to Arizona for the Rock 'n' Roll Arizona Half Marathon, after I was able to get the gig for the national anthem at the start of the half. The race would provide me with singing in a state I hadn't sung in yet - Arizona would be state #41. I flew out after work on Friday, and would be arriving late into Phoenix that night. The weather though had other plans -- New York was covered in fog for most of the entire day; after several weeks of freezing temperatures, we suddenly got a 50º day, and the snow on our streets that's stuck around since the previous week's nor'easter/bomb cyclone began to evaporate into the air. JFK had periodic ground stops throughout the day, and was piling up on delays. My flight ends up being delayed by about an hour after inbound flights that went from JFK to Cancun and back, but after taxiing for a relatively short period of time after boarding and a bumpy flight across the country, we end up arriving in Phoenix on schedule, considering JFK always has padded flight durations. I uber to my Airbnb, and get in and settled, ready to get my tired self to bed now that it's midnight in Arizona, but 2am back in NYC. 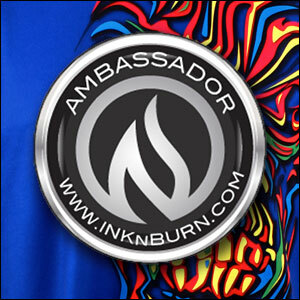 I sleep in the next morning and am out the door by 10:15 to head to the race expo in downtown Phoenix at the Phoenix Convention Center . 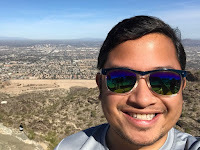 My Airbnb was located in Tempe near Scottsdale Road, just north of Arizona State Route 202 and Tempe Town Lake, so I decide to walk the one mile down Curry Road over to the light rail station at Washington and Center Parkway, which would take me downtown quickly and easily. I spend about an hour and a half at the expo, meeting up with my Black Sheep friends, many of whom I hadn't seen in quite some time. I also go to see Lisa and Ryan at the RnR booth, and Lisa was kind enough to connect me with someone who could inquire about me singing the national anthem at this summer's Rock 'n' Roll Chicago Half, which would check off the state of Illinois, one of the last two states I have left to book before reaching my goal of all 50 states. After spending a bit of time at the expo, I meet up with my other friend Jamie and her friend Audrey, both from Omaha, to get lunch within walking distance of the convention center at The Arrogant Butcher. After lunch, we head up to Jamie's sister's house in northern Phoenix, so I can finally meet her dog (yes, her dog) Kirby. 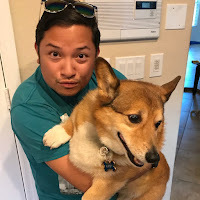 Kirby is an 11-year-old Pembroke Welsh Corgi, and you all know how obsessed with corgis I am. He's a chunky one, and loves to bark at EVERYTHING - yet at the same time has nervous shakes in his hind legs. Jamie had brought some toys for Kirby to play with, and within five minutes of receiving a stuffed banana, he is able to tear it apart, removing most of its cotton stuffing! He's quite a hoot. After our visit with Kirby, we find out that there's a... well, interesting... site to see only twenty minutes drive away... a suggestively shaped rock. We get there just as the sun is going down, and of course partake in a photo shoot as well as a Facebook live video with the rock in the background. 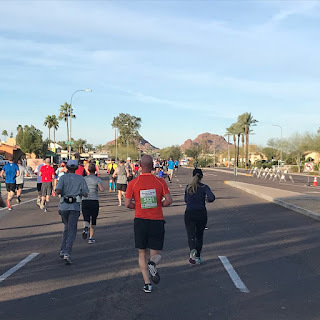 We then head to dinner in Phoenix at an Italian restaurant before Jamie and Audrey drive me back to Tempe to get some sleep before an early wakeup call for race morning. Sunday morning, I'm up by 5:30 to prep for the race. 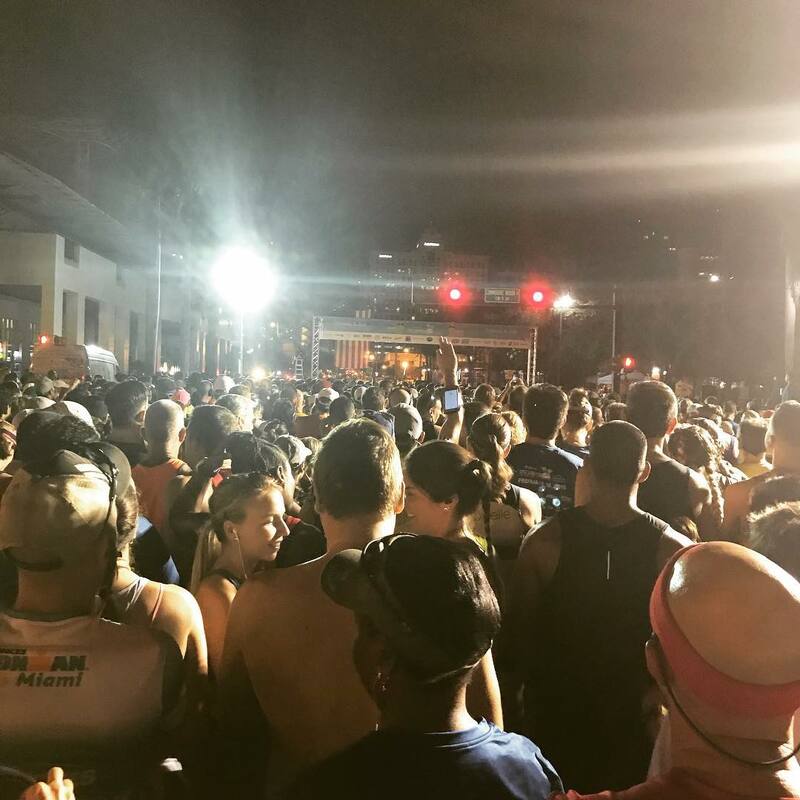 I'm out the door a little after 6am, and already, there's some traffic around downtown Tempe, with cars parking at garages suggested by the race. I have a Lyft take me to the brewery where VIP is having pre-race breakfast, and I end up seeing a few more Black Sheep friends and others who've participated in many Rock 'n' Roll events in the past. Around 7am, I go off to find a quiet corner to call into Delta, and am able to switch my outbound flight for Monday from a 7am direct flight to a 6pm connecting flight via Salt Lake City. This was most ideal for me, so I could avoid another early morning and I could spend most of the day enjoying the area on Monday. By 7:30, I'm headed down University Drive to the start area, for my call time to be at the start for the national anthem. 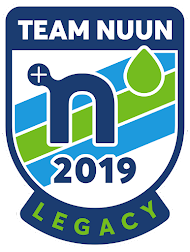 At the start stage, I recognize my friend Creigh Kelley, one of the nation’s most popular and recognizable race announcers, having been the voice of many of the largest triathlon and running events in the U.S. and abroad for the past 34 years. We exchange our pleasantries as he continues doing his thing with race announcements, and eventually, I am called up to sing the anthem. 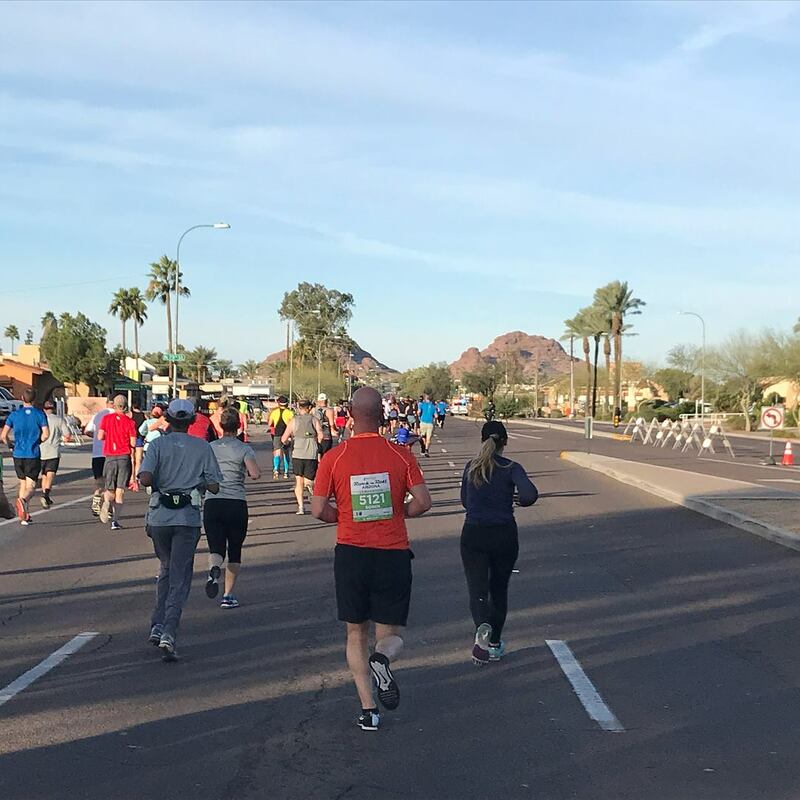 It's quite exciting, doing this again for thousands of people - there are over 8,500 runners in the corrals, with thousands more cheering or involved in the race in some way. After the anthem, I head back into the corrals, joining the other runners as we cross the startline minutes after the clock strikes 8. 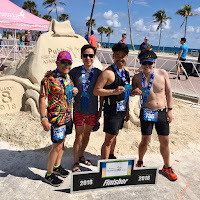 I decided to go out conservatively, as this is my first race back from injury - a calf strain that began to bother me back in mid-November after the Flying Monkey Marathon, and which I continued to run on for three more marathons in subsequent weeks. I hadn't done any long distance running since mid December, and only did one race since - a 4 miler in Central Park over New Year's. My goal was to get close to my average half marathon time - a 2:15, or roughly 10:20 average mile pace. Knowing that we were at an elevation higher than I'm used to (over 1100 feet), I just decided to feel out my legs for the first mile. 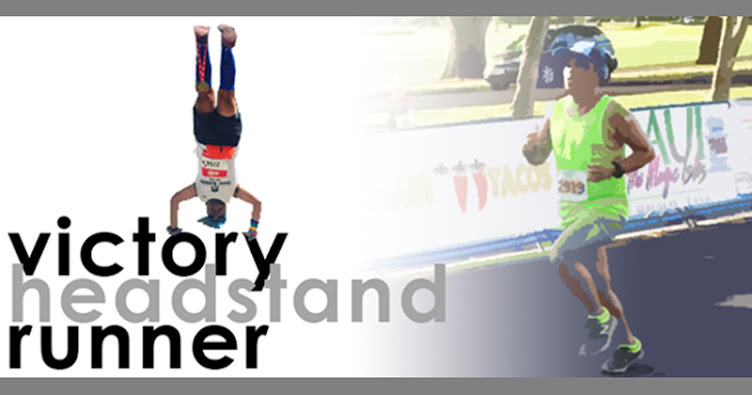 Not only that, but the first nine miles of this race was a gradual uphill from 1161 feet to 1352 feet. Surprisingly, I posted an 8:53, as we made our way eastward along University Drive into the rising sun. I took my first walk break at the 9 minute mark, and soon, we were turning north onto McClintock Drive, where we would begin to feel the climb. 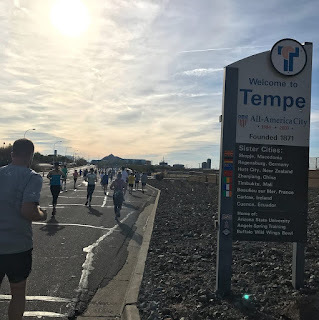 We passed Tempe Marketplace, and crossed the bridge over Tempe Town Lake and under the 202, making our way toward the point where the 10k runners and half runners would separate. SkySong at ASU, in Scottsdale. The half would continue northward into Scottsdale until the four mile mark, before turning left onto McDowell Road, where we'd do a quick detour off of the road through SkySong, the ASU Scottsdale Innovation Center, a campus of office buildings connected to Arizona State University. 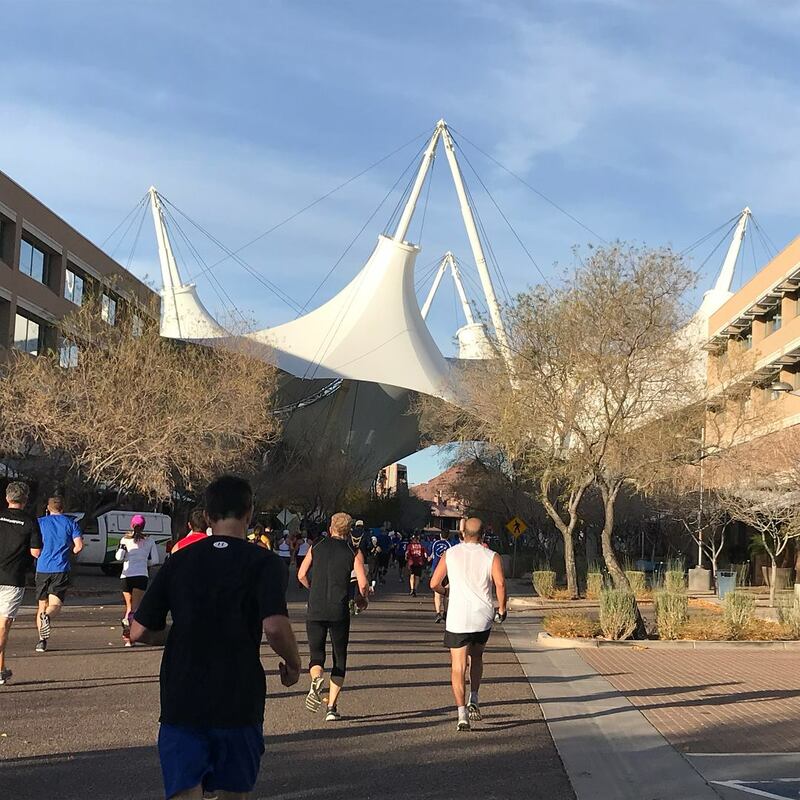 Notably, we would run underneath the SkySong shade structure, one of Scottsdale’s most recognized icons. 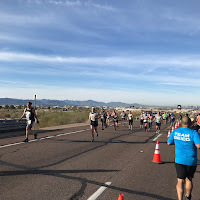 Soon we'd get back onto McDowell Road, before turning again and continuing north along Scottsdale Road, where we'd continue until Thomas Road, the furthest north we would run. 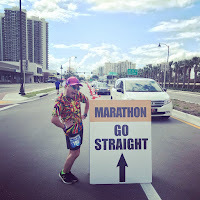 After turning left onto Thomas, we would pass the 7 mile mark, and I began to look out for the Lululemon cheer spot just past 68th Street, where my friend Jeremy told me he'd be cheering at. I found him and his boyfriend Jason pretty easily, and he captured some great photos of me in action, before I made my turn south along 64th Street, where we would continue past the 8 mile mark, and then the right turn onto McDowell, and the out and back taking us past the Papago Buttes in Papago Park, as well as the beautiful view of downtown Phoenix from an elevation of 1300 feet. Along the way, taiko drummers helped us manage our cadence as we made our way to the highest elevation point of the race; it was all downhill from the U turn point to the finish. 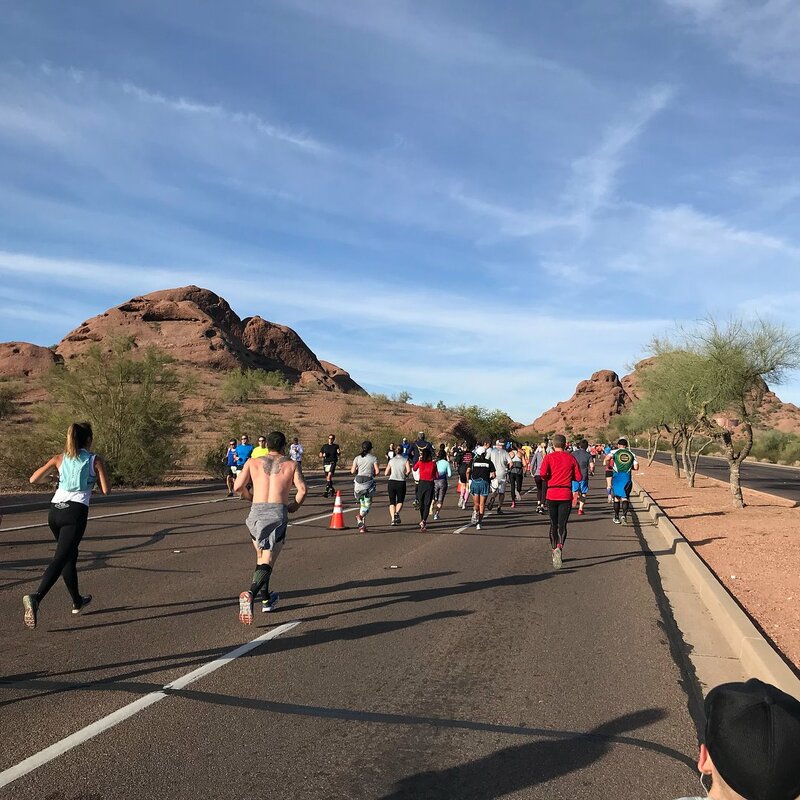 Papago Park, heading to the highest point of the race! We made our way back down McDowell, and continued along the Galvin Parkway, winding its way downhill. At the 10 mile mark I knew I was within reach of my 2:15 goal, so I picked up the pace and made for a sub 10 downhill mile inching me ever closer to the finish. Mile 11 came by just before we turned left onto Van Buren Street, and we reached the Tempe city limits as we merged onto Mill Avenue. 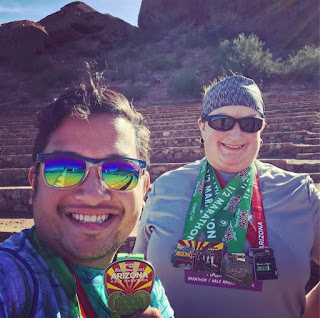 We ran underneath Center Parkway where we could clearly see the 25 mile marker for the marathon, and hit our own 12 mile marker along Mill Avenue not too long after that. 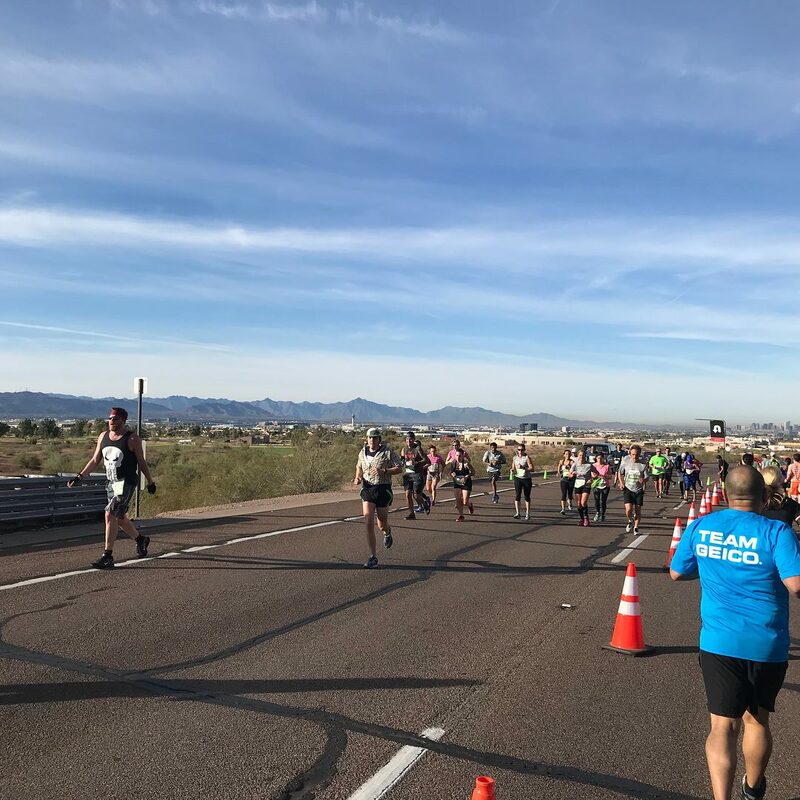 After passing underneath the 202, the Mill Avenue Bridge was right in front of us, and a half mile triumphant run to the finish line was in sight, lined with spectators cheering for the runners. 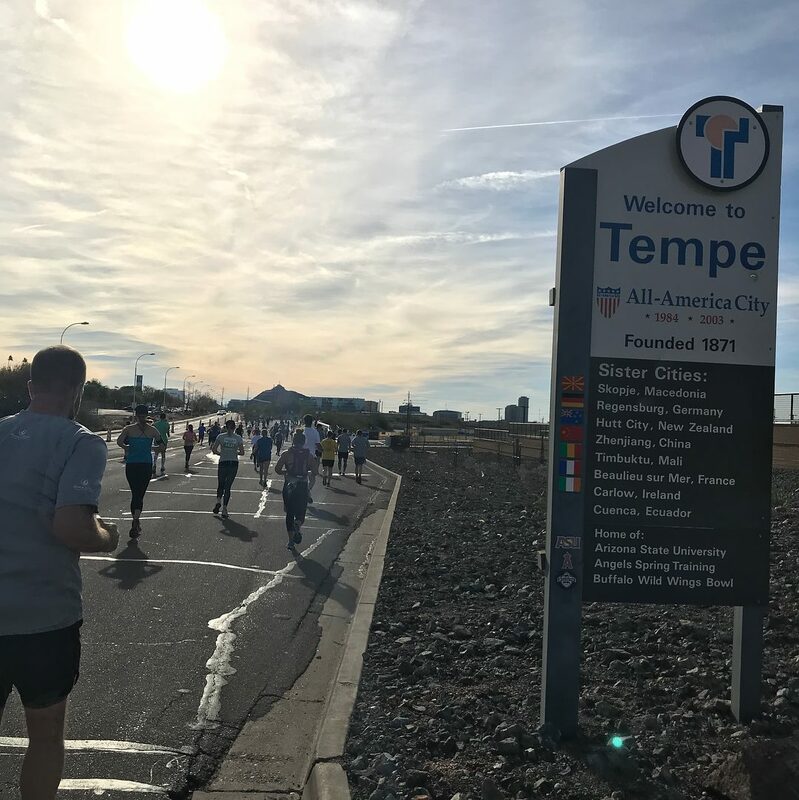 Headed back into Tempe along Mill Avenue, almost to the finish! I cross the finish line in 2:15:50, and I couldn't be more thrilled. Despite my walking along the way, I managed to finish very close to my goal time. 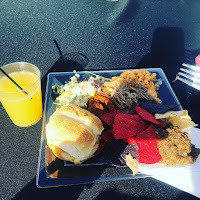 I headed straight toward VIP and partook in much needed food (there was a mac 'n' cheese bar!) and got a massage, and stuck around to enjoy music from Everclear at the headliner's concert. 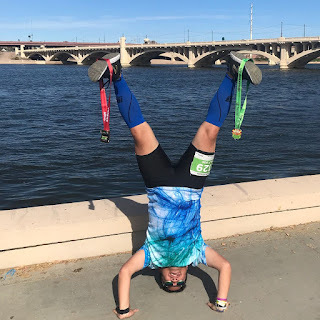 I waited for Jamie to come in, and we got our photos taken near Tempe Town Lake, and later driving to the part of the course in Papago Park, near the mile 9 turnaround. That night, I got together with Jeremy and Jason for dinner at Bar Louie at Tempe Marketplace, before heading to the movies to catch "The Greatest Showman" to cap off an exciting Sunday in Arizona. 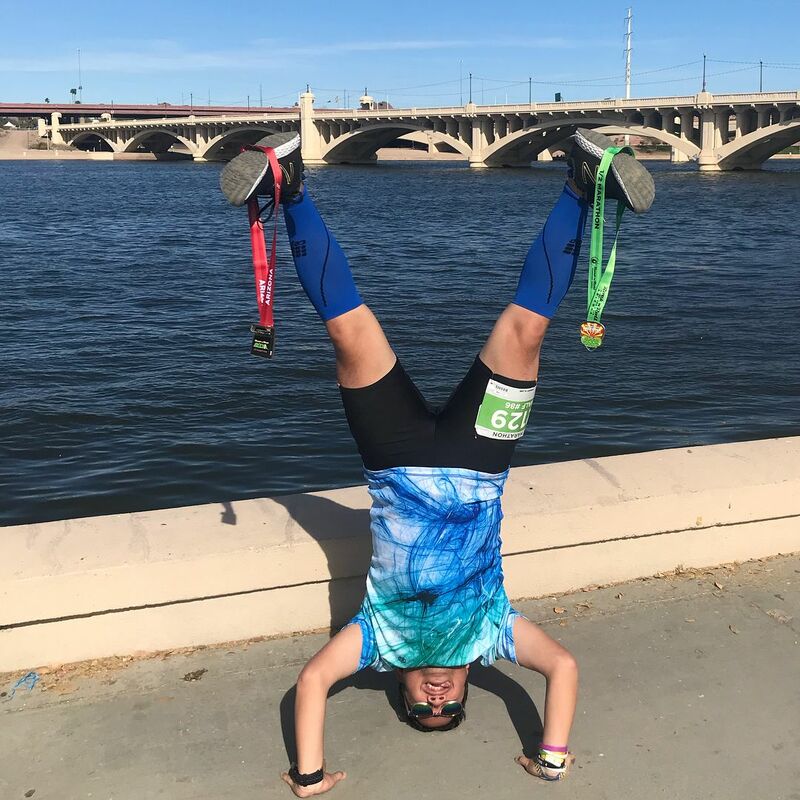 Victory Headstand at Tempe Town Lake! I got to sleep in on Monday morning since I had changed my flight, and checked out of my Airbnb before heading off to an açaí bowl place within walking distance, where I got breakfast to-go just as Jamie and Audrey pulled up to pick me up for adventures for the rest of the morning and afternoon. With about four hours to kill, we decided to drive to about 45 minutes away to Dobbins Lookout in South Mountain Park, roughly 13 miles south of downtown Phoenix. South Mountain Park is actually the largest municipal park in the United States, and one of the largest urban parks in North America and in the world. From the lookout, located at 2,330 feet, and is the highest point in the park accessible by trail or public roadway, we are able to get sweeping panoramic views of the Phoenix metro area. 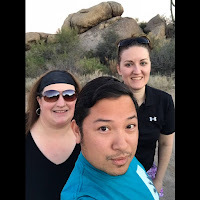 On our way back down, we stopped at the parking area near the Telegraph Pass Trailhead, and I even got Jamie to come out of her comfort zone for a little bit, hiking down a little ways down the rocky trail. We then headed into downtown Phoenix for a late lunch, grabbing some delicious Mexican food at Taco Guild, a gastropub set in a deconsecrated Methodist church that was originally built in 1893. With it pushing 3pm, we decided to head back to the airport since we still had to get gas and drop off the rental car. I parted ways with Jamie and Audrey, headed back to Omaha, as I was off to Salt Lake City for my connection in a different terminal. My trip home was uneventful, with a lengthy layover in SLC before my redeye back to JFK, and of course... a full work day ahead of me upon landing on Tuesday morning. What a weekend!